A family Château for 4 generations, “Haut de Lerm” is located in the heart of the Bordeaux appellation, between terroirs of Saint-Emilion and Graves, near Sauveterre de Guyenne, medieval 13th century village. The property covers 30 ha in one piece, on the heights of the village. The vines are 15 ha exposed hillside around the wine storehouse. Great granddaugthers of winegrowers, the resumption of the family winegrowing property took place in 1998. 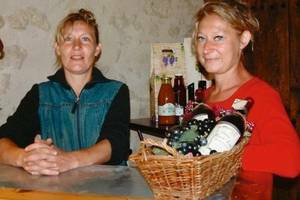 Christelle and Valérie have followed viticulture and oenologiy studies. Their main activities were financial framework at Bouygues and educator with disabled adults in a C.A.T. 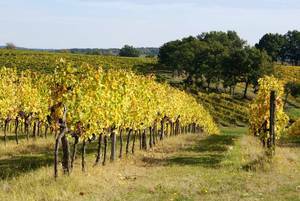 They specialized in oenology since the resumption of operations as well as direct sales to individuals in France and abroad. Christelle et Valérie welcome you with pleasure all year long, for you to discover the fruit of their work and especially their passion. Come and share their passion !! Cabernet Sauvignon forms the structure of the wine, this variety embodies the Médoc wines and forms the basis of the Graves vineyards. It produces firm and tannic wines meant to age. Elegant in their youth, they become complex when aging. Merlot brings the fruit, roundness and flexibility. Malbec gives a powerful and flagrant wine.